"He indeed was foreordained before the foundation of the world, but was manifest in these last times for you" (1Pet 1:20). "[Resting] in the hope of eternal life, [life] which the ever truthful God Who cannot deceive promised before the world or the ages of time began." (Titus 1:2). "Now to him that is of power to stablish you according to my gospel, and the preaching of Jesus Christ, according to the revelation of the mystery, which was kept secret since the world began," (Rom 16:25). "and to make all see what is the fellowship of the mystery, which from the beginning of the ages has been hidden in God who created all things through Jesus Christ;" (Eph 3:9). "the mystery which has been hidden from ages and from generations, but now has been revealed to His saints." (Col 1:26). God's eternal purpose is strew all over the epistles of Paul. 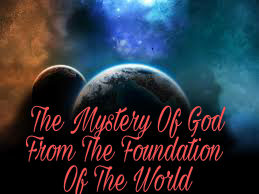 Paul also called it the mystery of God from the foundation of the world. It is God's highest passion, His ultimate obsession and He had been pursuing it right from eternity past, before the world was created. This eternal purpose of God governs everything that God does: "according to the purpose of Him who works all things according to the counsel of His will" (Eph 1:11). In this verse Paul explained that everything God does is according to His purpose (the eternal purpose). God's eternal purpose is very huge, it is not something that can be written down, for it has a lot of faces. This eternal purpose is the very wisdom of God and the wisdom of God is described as "many-sided, infinite variety and innumerable aspects" (Eph 3:10). Therefore one cannot exhaust the whole of God's eternal purpose in writing. What we attempt to do here is to trace the back bone i.e the center that spring into the many faces. Because looking at it from It's many sides will only bring confusion and it is impossible to explore all the sides. This verse reveals a fragment of the eternal purpose. It shows that this purpose involves 'us' i.e all those who are chosen in Christ and this refers to the Church. So God's eternal purpose is to have a Church and this Church is to be the body of Christ. Now, looking at the Trinity the Father expresses Himself through His Son but by His Spirit. The eternal purpose spring forth from God's desire to express and reveal Himself. God expresses Himself through His Son but still He desires to extend the expression and the revelation of Himself. And that His why He decided to give His Son a body. The Scriptures reveals that the Church is the revelation of God. "So God can point to us in all future ages as examples of the incredible riches of his grace and kindness towards us, as shown in all he has done for us who are united with Christ Jesus." (Eph 2:7 NLT). "[The purpose is] that through the church the complicated, many-sided wisdom of God in all its infinite variety and innumerable aspects might now be made known to the angelic rulers and authorities (principalities and powers) in the heavenly sphere." (Eph 3:10). Every creature in heaven and on earth would come to know God through his Church, for He would be revealed and expressed through His people in Christ. Paul said "the eternal purpose which He accomplished in Christ Jesus our Lord," (Eph 3:11). God's eternal purpose is fulfilled in Christ because the Church is a people in Christ. Therefore God's eternal purpose is to have a people in Christ through which He would express and reveal Himself. 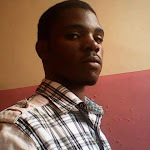 Now, for God to be able to fully express and reveal Himself through the Church, He needs the Church to be fully matured according to the status of Christ. God can only be revealed and expressed through Christ and for the Church to be able to fulfill her purpose she needs to be conform to the image of Christ. The above verse also reveals God's eternal purpose which is to have a people fully conformed to the image of His Son through which He would express and reveal Himself. Therefore what God had been pursuing before creation to the day of Pentecost is to have a Church. Then from the day of Pentecost to the second coming of Christ, God is working towards building the Church until it reach full maturity. And after the second coming of Christ unto eternity God would be focus on revealing and expressing Himself through the Church to all creature in heaven, earth and beyond.